The Chesapeake Bay is a beautiful and invaluable resource to the region and beyond. It is host to a fantastic variety of uses that include numerous active seaports, recreational and commercial fishing pursuits, a destination for millions of annual visitors, a strategic gateway for maritime traffic seeking access to U.S. shores, and home to the Calvert Cliffs Nuclear Power Plant, to name just a few. Can I Get It In Real-Time? With a fleet of approximately 140 vessels to cover the Chesapeake Bay’s sprawling 64,000 square miles, the MNRP relies heavily on technology to help it successfully perform its duties. In particular, the MNRP has employed craft-mounted video surveillance for many years, but until recently, a significant limitation was that the video feed could only be stored locally and downloaded once the boat was docked. For optimal operational efficiency and safety, they needed to find a solution to enable realtime video streaming. The DNR searched for more than four years to find an acceptable solution. Their search spanned a slew of different vendors, and the gamut of technologies, including WiFi mesh, WiMax, LTE cellular, and a number of proprietary point-to-multipoint wireless solutions. Still, none of these met their baseline requirements of delivering up to 3 Mbps throughput at up to seven miles off-shore while traveling at up to 20 knots. 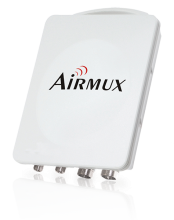 Finally, acting on a recommendation from a trusted wireless technology integrator, they identified RAD’s Airmux Mobility wireless solution as a viable candidate. Certainly, the Airmux Mobility solution’s documented capability to support up to 100 Mbps throughput on an unlicensed frequency seemed promising. The next step was to put it to the test. Provide a wireless mobility solution to enable high quality, real-time video streaming from police boats traveling over a wide stretch of Maryland’s Chesapeake Bay. RAD’s Airmux Mobility solution for this application delivers over 4 Mbps throughput per boat while traveling at up to 20 knots over distances of up to seven miles. "The success of the DNR maritime application, with the unique challenges it presents, is a testament to the merits of our mobility solution." With a fleet of approximately 140 boats to cover 64,000 square miles…they needed to find a solution to enable realtime video streaming. The DNR invited RAD to conduct a proof-of-concept trial that involved deploying a couple of base stations with dual sector antennas on one of their towers. In tandem, selected police boats were equipped with an Airmux subscriber unit and two omni antennas. The use of two sector antennas at each endpoint enables the solution to operate in diversity mode for maximum reliability and resiliency, even in this particularly challenging environment. The proof-of-concept went flawlessly. As they patrolled vast stretches of the bay, the video feed streamed continuously with seamless handoffs between the sectors. The solution easily met the baseline requirements for throughput at the target nautical speed. Clear, high quality color video streamed without a hitch. With the successful completion of the proof-of-concept, the MNRP has moved into full deployment mode, outfitting dozens of towers and many police boats. After a long and arduous search, they finally found the right solution. Ideal for video surveillance and security operations, border and perimeter protection, and transportation applications.